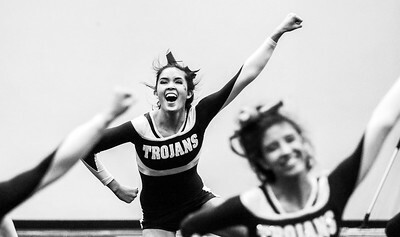 Kyle Grillot - kgrillot@shawmedia.com Mixed emotions fill the faces of Jacobs varsity cheer teammates after their routine during the Fox Valley Conference cheerleading competition Monday, January 19, 2015 in Woodstock. Kyle Grillot - kgrillot@shawmedia.com The Huntley Varsity cheer team after the end of their routine during the Fox Valley Conference cheerleading competition Monday, January 19, 2015 in Woodstock. The Huntley girls took first place in the Valley division. 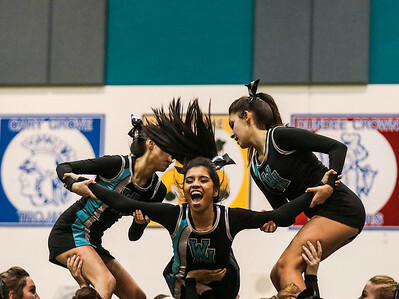 Kyle Grillot - kgrillot@shawmedia.com Woodstock North's Bianca Rendon (center) falls towards the arms of her teammates while performing during the Fox Valley Conference cheerleading competition Monday, January 19, 2015 in Woodstock. Kyle Grillot - kgrillot@shawmedia.com The Huntley Varsity cheer team jump in celebration as their name is announced as the first place winners of the Valley division during the Fox Valley Conference cheerleading competition Monday, January 19, 2015 in Woodstock. 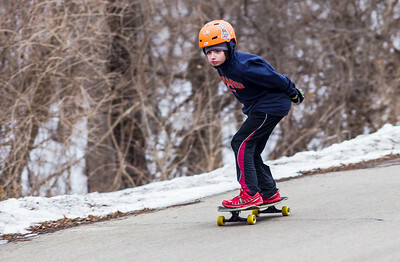 Kyle Grillot - kgrillot@shawmedia.com Sam Ilkow, 12, of Crystal Lake longboards down Kilkenny Drive Monday, January 19, 2014 in Crystal Lake. Ilkow and a group of about ten friends were taking turns riding down hills warning each other when cars were approaching. 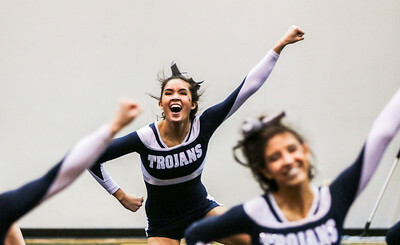 Kyle Grillot - kgrillot@shawmedia.com Cary-Grove junior Maddie Kraft performs with the varsity cheer team during the Fox Valley Conference cheerleading competition Monday, January 19, 2015 in Woodstock. 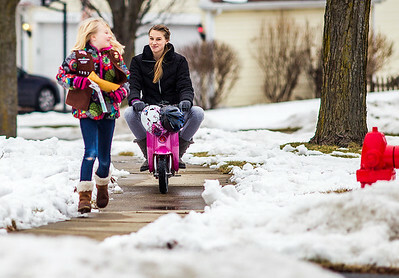 Kyle Grillot - kgrillot@shawmedia.com Allison Mathesius, 8, runs as her sister Amber, 14, follows behind her while selling girls scout cookies on Fernwood Court Monday in Cary. Amber, who used to be in girl scouts now helps her little sister as she goes door to door trying to make sales. 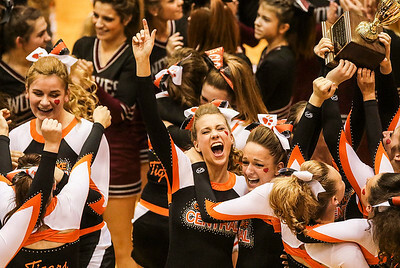 Kyle Grillot - kgrillot@shawmedia.com Crystal Lake Central junior Britney Iden (center) celebrates with her teammates after their name is announced as the first place winners of the Fox division during the Fox Valley Conference cheerleading competition Monday, January 19, 2015 in Woodstock. Kyle Grillot - kgrillot@shawmedia.com Crystal Lake Central junior Sara Stewart competes with her team during the Fox Valley Conference cheerleading competition Monday, January 19, 2015 in Woodstock. The Crystal Lake Central team took first place in the Fox division during the competition. Kyle Grillot - kgrillot@shawmedia.com Crystal Lake South's Sabrina Rivera (left) has hand held by Crystal Lake Central's Lily Murphy after injuring her leg during the Fox Valley Conference cheerleading competition Monday, January 19, 2015 in Woodstock. Kyle Grillot - kgrillot@shawmedia.com Crystal Lake South junior Sabrina Rivera (left) is helped off the mat by Shauna Becker after injuring her leg during the Fox Valley Conference cheerleading competition Monday, January 19, 2015 in Woodstock. 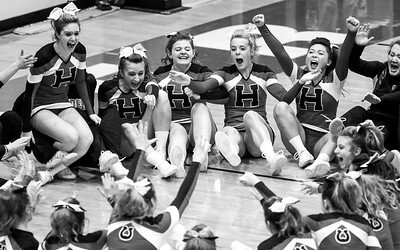 Kyle Grillot - kgrillot@shawmedia.com The Huntley Varsity cheer team celebrates after their name is announced as the first place winners of the Valley division during the Fox Valley Conference cheerleading competition Monday, January 19, 2015 in Woodstock. Kyle Grillot - kgrillot@shawmedia.com Huntley freshman Payton Cariato holds a pose as she is lifted into the air during their performance during the Fox Valley Conference cheerleading competition Monday, January 19, 2015 in Woodstock. The Huntley girls took first place in the Valley division. Kyle Grillot - kgrillot@shawmedia.com The Jacobs varsity cheer team performs their routine during the Fox Valley Conference cheerleading competition Monday, January 19, 2015 in Woodstock. The Huntley girls took first place in the Valley division. Kyle Grillot - kgrillot@shawmedia.com Prairie Ridge sophomore Quinn Regner holds a pose as she is lifted into the air during her team's performance at the Fox Valley Conference cheerleading competition Monday, January 19, 2015 in Woodstock. Prairie Ridge took third in the Fox division. Woodstock North's Bianca Rendon (center) falls towards the arms of her teammates while performing during the Fox Valley Conference cheerleading competition Monday, January 19, 2015 in Woodstock.